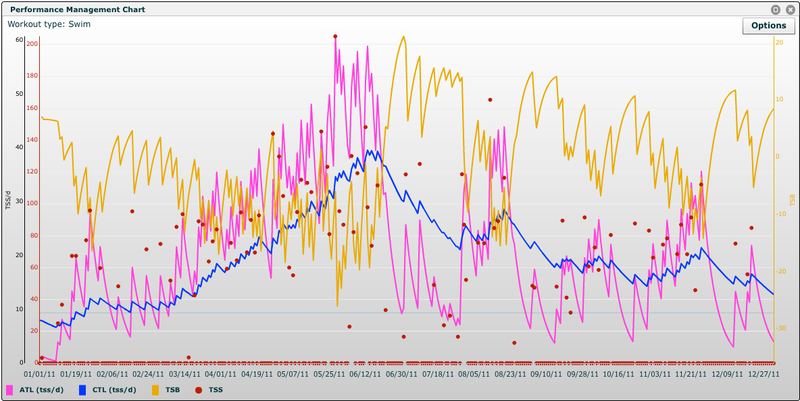 This was a little bit of a frustrating year with training. Because of my injury, I still haven’t been able to run (even though I may have done some anyway), and at times I’m starting to think that even cycling is aggravating it. I had an MRI on it, and nobody so far has been able to adequately fix it. I’m on a cycle where I change one thing, wait six weeks, reassess. It’s at the point where even if I walk a couple kilometres I can feel it after. At this point I’m almost ready to take some drastic measures to get it under control. There hasn’t been a lot of consistent training, but I’ve still managed to do a fair bit compared to last year. So I actually swam four times the distance I ran this year! The great thing about that, is when I was able to run, neither my speed nor my endurance really seemed to suffer that much. I maintained most of the gains that I made last year, likely due to all the cross training (read swimming). Here’s a chart showing my total training duration for the year, week by week. You can see a peak in the end of August and beginning of September, where I was fully putting in my last effort for Syracuse. I technically should have been putting in that many hours training most weeks during the year. My swim fitness chart looks fairly similar, but without the big push at the end. I didn’t get in a lot of swimming during the summer, so my fitness suffered. It never got back to the peak it was at just before finishing with Ayesha for the season. At least at the point I’m at now, I’m still much further ahead than I was last year at this time. This year It looks like I’m going to be realigning my goals. First I’m going to get something done with my foot. I’m not planning on running at all this year, and depending on how I feel, I might not even do much biking. If I have to get it surgically repaired I will. It hurts all the time, and it’s preventing me from even walking. Swim will be my main focus for this year. I’m going to do a 10k open water swim. I’m going to increase my fitness over last year. I’m going to make a push to avoid dropping off like I did last summer. Maybe I’ll spend a little more time just enjoying the summer for the sake of enjoying the summer too. Here’s hoping that 2012 is as awesome as 2011!